Five Truman graduates are currently serving as Fulbright scholars for the 2013-2014 academic year, a distinction that places the University in the top five master’s colleges and universities in the nation for number of award recipients, according to the Bureau of Education and Cultural Affairs of the U.S. Department of State. All of Truman’s Fulbright recipients teach English in schools or universities. Students selected and the countries for which they received grants include: Shawn Bodden, Georgia; Clara Dahmer, Andorra; Ashley Kleiner, Taiwan; and Hope Schaeffer, South Korea. Additionally, Bethany Hoekzema, an MAE graduate, was named one of 12 recipients of the Fulbright/HAEF Teaching Fellowship co-sponsored by the Fulbright Program and the Hellenic American Educational Foundation. Hoekzema is currently teaching in Greece. Fellows act as young ambassadors and provide a cross-cultural educational experience by infusing their culture, ideas, language and knowledge into the school’s community. The Fulbright U.S. Student Program is the largest U.S. exchange program offering opportunities for students and young professionals to undertake international graduate study, advanced research, university teaching and primary and secondary school teaching worldwide. The program awards approximately 1,800 grants annually in all fields of study and operates in more than 155 countries worldwide. Truman was recognized in the Oct. 28 online edition of the Chronicle of Higher Education for being a top producer of Fulbrights. 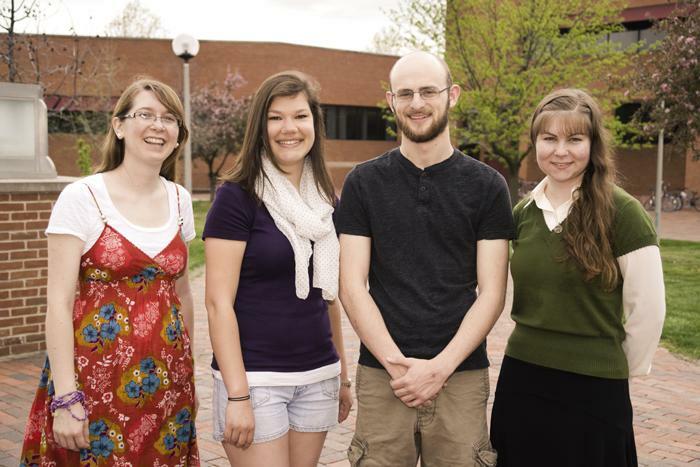 Truman Fulbright recipients, from left to right: Ashley Kleiner, Clara Dahmer, Shawn Bodden and Hope Schaeffer. Not pictured: Bethany Hoekzema. The campus is invited to get in the holiday spirit by hearing the Grammy award-winning Kansas City Chorale perform classical holiday music that includes works by the late composer Benjamin Britten and a sleigh full of favorite Christmas carols. The concert will take place at 7:30 p.m. Dec. 7 in Baldwin Auditorium. 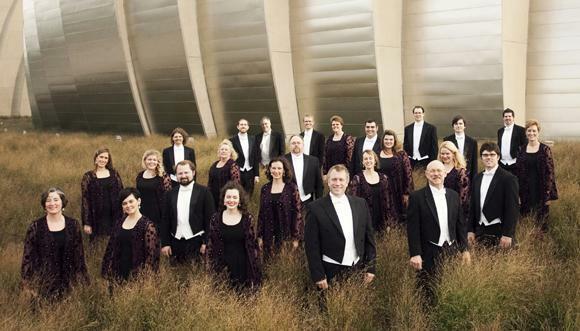 The Kansas City Chorale has provided audiences with a high caliber of choral artistry, performing a historically diverse repertoire of both new and traditional music. Winners of multiple Grammy awards, the choir has garnered international recognition for artistic merit, having been praised for their refined sound, phrasing and flawless intonation. In 2009, the Chorale made its New York debut, with the Phoenix Chorale, in Alice Tully Hall at Lincoln Center. The New York Times referred to the choirs’ “refined sound and elegant phrasing” as well as its “vivid intensity,” and praised the performance for its “buoyant pulse and energetic finesse.” In 2007, the Chorale’s recording of Grechaninovís “Passion Week” received a Grammy award for Best Engineered Classical Album, along with four other nominations, including Best Classical Album. The Chorale won two Grammy Awards in 2012 for their recording, “Life and Breath: Choral Works of Rene Clausen” and for Best Choral Performance. Frank Fleschner, a Kirksville High School graduate and 2005 Truman graduate, sings with the Chorale. While at the University, he was very involved in the choral scene, including Cantoria, University Choral and the Chamber Choir. After graduation, Fleschner auditioned for the Chorale and moved to Kansas City. Tickets will be available free of charge for students, faculty and staff starting Nov. 19 in the Student Union Building. Students may pick up their tickets at the SAB Office and faculty and staff may get their tickets at the information desk. General admission tickets may be purchased for $7 at Edna Campbells, the cashier window in McClain Hall or online at lyceum.truman.edu. For more information, visit lyceum.truman.edu or call 660.785.4016. The University Wind Symphony II will play music from the Steven Spielberg film “Lincoln” at 8 p.m. Nov. 20 in Ophelia Parrish Performance Hall to commemorate the 150th anniversary of the Gettysburg Address. The full program will include music by Alfred Reed, Jan Van der Roost, Gordon Jacob and Howard Hanson, and will be conducted by graduate student conductors Samuel Lucas and Luiz Viquez. The concert is free and open to the public. For more information, call 660.785.4417. Members of the “Students for Middle East Peace” (SMEP) group hosted an all-day fundraising sale of kettle corn Nov. 11 to raise funds for next semester’s programming. The SMEP group hopes to sponsor a “Middle East Film Event” and also a University-wide panel presentation with position papers on controversial Middle East issues. Although membership in the group is comprised primarily of students who have participated in the summer Middle East Study Abroad course, membership is open to all. For more information, contact Victoria Meeks, president of SMEP, at vlm567@truman.edu. 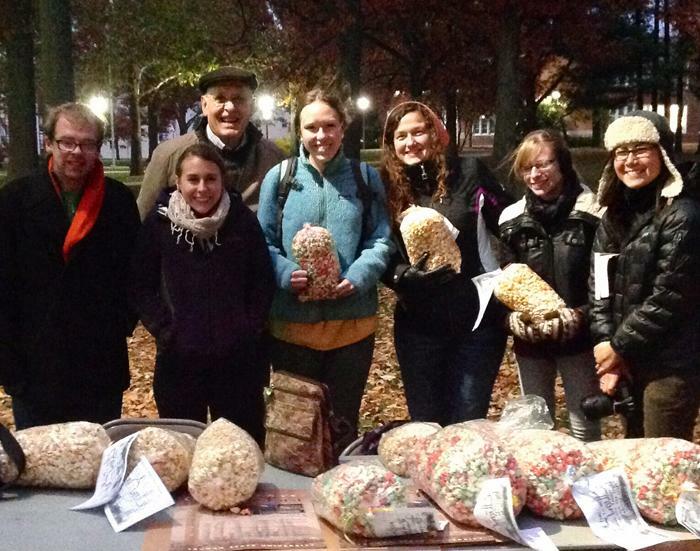 Students sold kettle corn on the Quad to raise money for future programming. 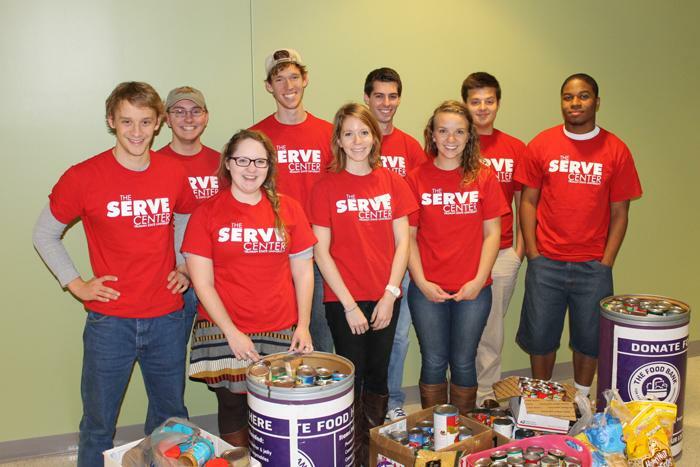 The SERVE Center raised nearly $1,500 and collected 1,000 pounds of food during the Big Week of Giving Oct. 28-Nov. 1. Donations were made by Truman students and Kirksville residents. All food and money raised will go to the Northeast Central Missouri Food Bank. 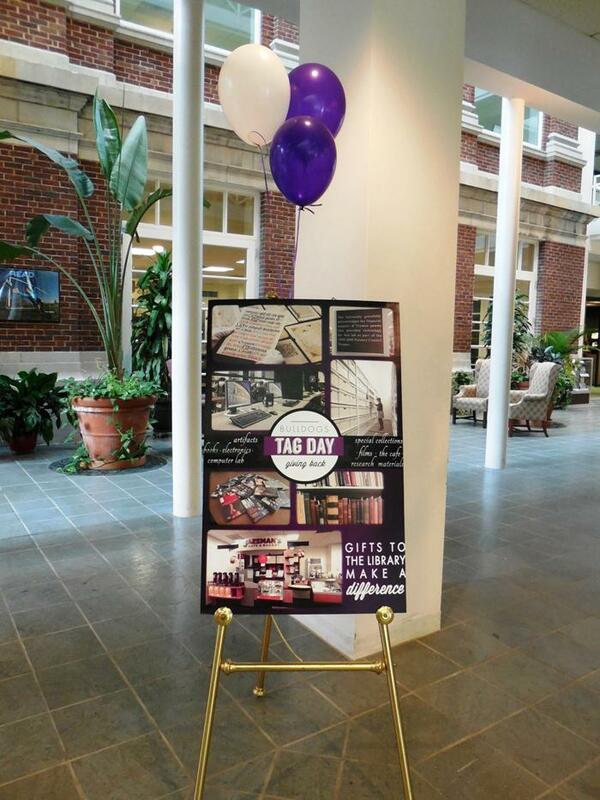 On Nov. 15, the Truman community showed its appreciation for University donors by hosting Tag Day. Items all over campus provided by private donations were tagged. Some of the items that were tagged include computer labs in Violette Hall and Pickler Memorial Library, classrooms and the Cyber Café in Magruder Hall, gardens and outdoor sculptures, the Severns Theatre and Class of 1950 Lobby, the bell wall and more. Signs across campus also identified intangible items made possible by private donations such as scholarships, internships and faculty development. 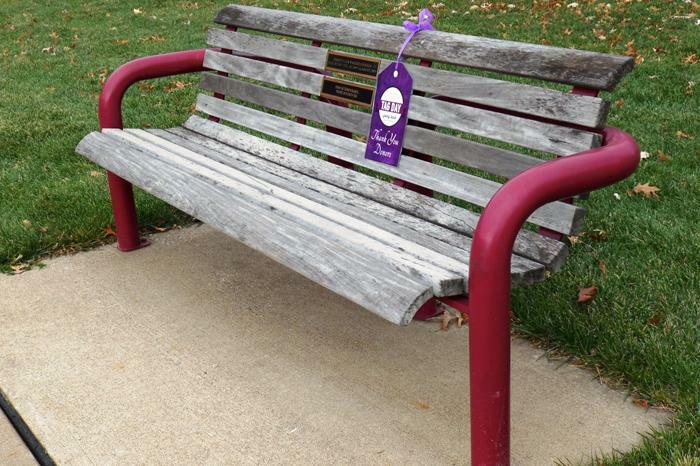 The goal of Tag Day is to raise awareness of the impact private donations have on the Truman campus. Last year, nearly 7,000 alumni, parents, faculty/staff, students and friends of the University donated to Truman. 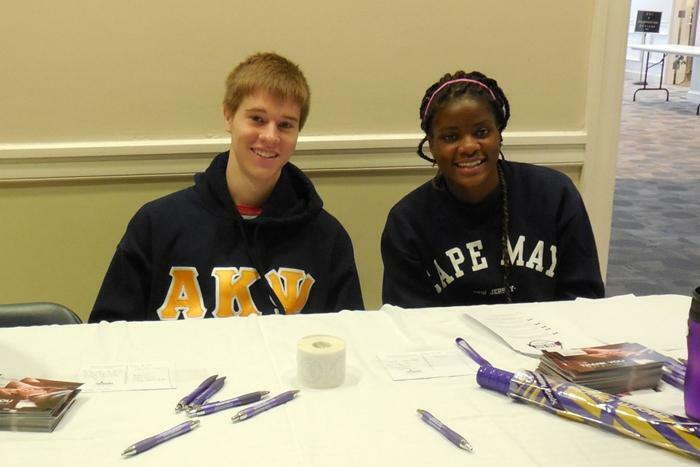 Tag Day included the opportunity for students to say “thanks” by signing thank you notes to Truman donors. Tags will remain up through Nov. 21.
staff the table where students wrote thank you notes to donors. 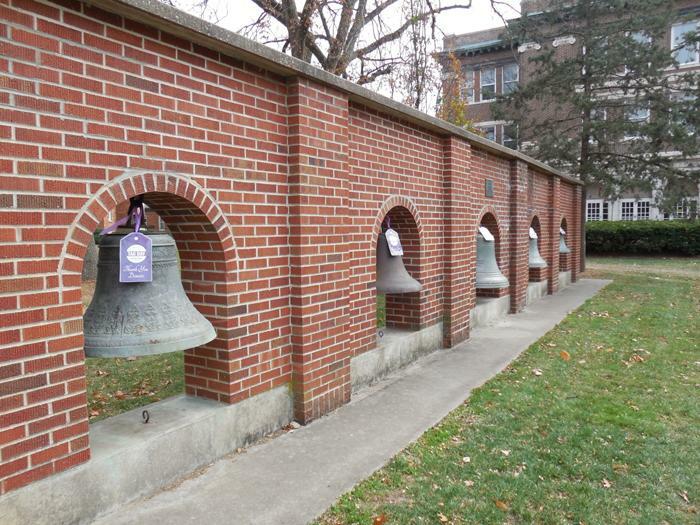 The Bell Wall and all the bells in it were donated to the University. Donations fund campus improvements such as this bench by Violette Hall. by supporting special collections and Jazzman’s Library Café. 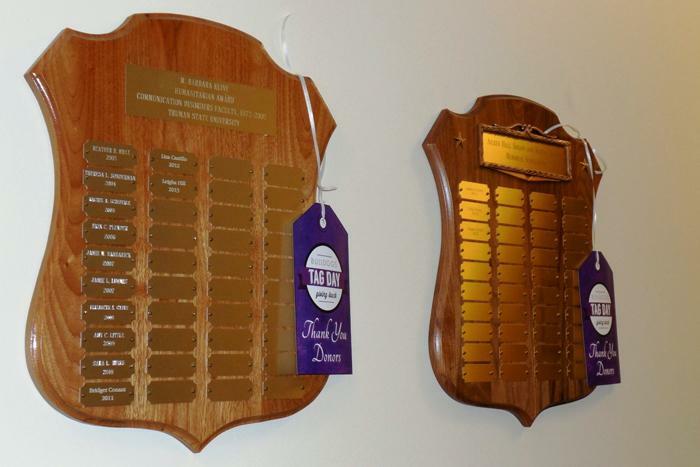 Scholarship plaques honor Communication Disorder students. Last year the University awarded more than $500,000 in scholarships made possible by donors. Students can learn how The Affordable Care Act impacts them by hearing about topics such as: who is required to obtain coverage and who is exempt, health insurance marketplace/exchanges, subsidies for insurance, individual mandates and penalties. Information sessions will be led by Vickie Cooper from Northeast Missouri Caring Communities. NEMOCC is a non-profit group that provides information about The Afforable Healthcare Act. Sponsored by Student Affairs. Alpha Phi Omega is sponsoring a dodgeball tournament benefitting Campfire USA at 12:30 p.m. Dec. 7 in Pershing Arena. Campfire USA is an affiliate of the United Way that works to help kids build confidence and become future leaders. This year’s theme is Survival of the Fittest and all teams are encouraged to dress up according to the theme. Registration is now open and participants can fill out forms online until Dec. 4. The cost to participate is $25 per team, and each team must include at least two women. The link for sign-ups can be found here. Elaine McDuff, professor of sociology and chair of the Department of Society and Environment, will present the third Global Issues Colloquium of the semester, “Women’s Voices from the Zimbabwean Diaspora: Migration and Change,” at 7 p.m. Nov. 21 in Magruder Hall 2001. The increasing feminization of Zimbabwean migration is part of an overall increase in international migration from Zimbabwe since 1990, primarily to destinations in South Africa and the United Kingdom, though Zimbabweans are now present in many countries throughout the world. There are currently 3-4 million Zimbabwean migrants, or between 25-30 percent of the country’s total population of 12 million. Most Zimbabweans leaving the country in the last two decades have been forced to do so because of economic and political problems, and it is women who have experienced the most dramatic change in level of migration. The Weingartner Digital Citizenship Challenge is a competition designed to address the issues of democratic citizenship in the digital age. Applicants are asked to submit three short essays describing their ideas on how the Internet can be used to foster a vibrant democracy characterized, among other things, by civic engagement, civil discourse, an informed citizenry and a responsible and transparent government. Three awards of up to $2,000 are available for the best ideas submitted by Jan. 5, 2014. Those chosen as finalists will have their ideas presented at the Weingartner Digital Citizenship Forum Feb. 11, 2014. The Challenge is an initiative created by dotDemocracy, a nonpartisan organization founded by the Weingartner Policy Fellows at the College of William and Mary. The application for the Challenge, as well as other information on dotDemocracy and the Forum, can be found at dotdemocracy.org. For Spring 2014, FAC has approved funding applications for 18 FAC organizations and 18 ICA organizations. For funding detail, visit fac.truman.edu to view the complete slate approved by Student Senate. Pickler Memorial Library has a new KIC Touchscreen BookEdge Scanner that can easily scan books or other documents and save them to a flash drive, upload them to Google Docs, or send them wirelessly to a smart phone or tablet. An email option is also available, however it is limited to faculty, staff and students as network authentication is required. The scanner is located in the printer/copier area on the first floor of the library. For questions, call 660.785.4051 or stop by the library service desk. The Academic Competition Organization fielded two teams Oct. 26 at the Washington University in St. Louis mirror of Penn Bowl. The A Team, comprised of Jacob O’Rourke, Selena Montes and Nick Jones, placed fifth with a 6-4 record. The B Team, comprised of Uday Malhotra, Hannah Cameron-Atkinson and Gabe Hota, placed eighth with a 0-10 record. O’Rourke also finished third individually in scoring. Statistics can be found here. Clarinet students traveled to St. Louis Nov. 7 to compete in the Missouri Music Teachers Association College Woodwinds Competition. Emily Mehigh, senior music major, won the upper division competition. Charlyn Ortmann, sophomore music major, won the lower division competition. Taeyeong Jung, freshman music major, received honorable mention. Truman students competed in the 2013 Truman Gold Medal Concerto Competition on Nov. 9-10, judged by Peter and Soyoun Chun from the University of Kansas. The three winners that were selected were Nate Buttram, baritone, singing Korngold’s “Tanzlied des Pierrot,” Chelsea Lundberg, flute, playing Reinecke’s “Concerto in D Major, Op. 283,” and Luis Viquez, clarinet, playing Hoffmeister’s “Concerto in B-flat Major, Op. 36.” The winners now have the opportunity to perform their pieces with the University Orchestra in the spring. There will be a Coffee with the President from 2:30-3:30 p.m. Nov. 18 in Barnett Hall 1218. The Brass Choir Fall Concert will start at 8 p.m. Nov. 18 in Ophelia Parrish Performance Hall. The live performance will feature student soloists. Experience the Middle East information sessions will be at 6:30 p.m. Nov. 18 in McClain Hall 209 and 4 p.m. Dec. 11 in McClain Hall 212. For more information on the program, email mappold@truman.edu. The International Club is sponsoring the Heifer International Fashion Show from 7-8:30 p.m. Nov. 19 in the Student Union Building Activities Room. The event will showcase diverse traditional wear from around the world. Tickets will be sold around campus the week before and at the door for $3. All proceeds will go to Heifer International. A lecture recital featuring Chinese traditional music and song will be at 1:30 p.m. Nov. 21 in Ophelia Parrish Performance Hall. The performer, Wang Jinfeng, is a scholar in residence and a music professor from Tsinghua University in Beijing, China. The University Chorus will have their fall choral concert at 8 p.m. Nov. 21 in Ophelia Parrish Performance Hall. Grants-In-Aid-of-Scholarship and Research (GIASR) applications are due to the Office of Student Research by 11:59 p.m. Nov. 22. Applications can be found at secure.truman.edu/osr-s/. Members of the senior nursing class will host a World AIDS Day Memorial Service from 7-7:30 p.m. Dec. 3 at the Eternal Flame in front of Kirk Memorial Building. For more information, email nursing@truman.edu. The University Concert Band will perform at 8 p.m. Dec. 4 in Baldwin Auditorium. The One-Act Play Festival will be at 8 p.m. Dec. 5-7 in the Black Box Theatre. The show will consist of student directed one-act plays. Admission is free, but seating is limited. Tickets can be reserved at the theatre box office of Ophelia Parrish. Two summer internships are available at the Harry S. Truman Presidential Museum and Library. Applications are due Dec. 6. For more information, contact Jeff Gall at 660.785.7747. The University Steel Band “Truman Steel” will perform their holiday concert at 8 p.m. Dec. 6 in Ophelia Parrish Performance Hall. Alpha Sigma Gamma will be hosting their annual Holiday Market Craft Fair from 9 a.m.-5 p.m. Dec. 7 in the Student Union Building Hub. 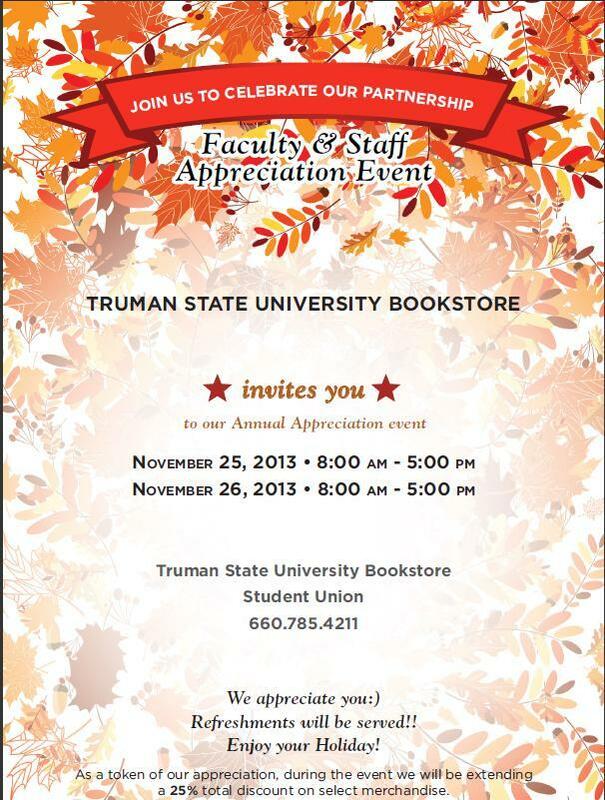 Craft vendors from across the state will be selling holiday goods and Truman students will provide live music. The event will benefit Victim Support Services. The 57th Annual Finals Scream will be from 10 p.m.-12 a.m. Dec. 8 in the Student Union Building. Students will meet up to let out screams in between preparing for finals. There will be games, relaxation techniques, crafting activities, food and giveaways for different types of screams.